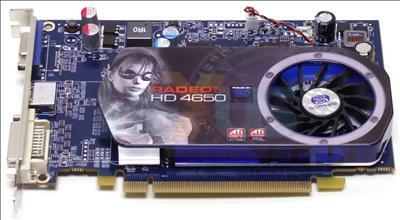 ATI brought its mid-range graphics-card line-up up-to-date with the release of the Radeon HD 4600-series in September of last year. The series included two SKUs - HD 4650 and HD 4670, differentiated with respect to clock-speed on the core, shaders and memory. Their main strengths were decent performance via full DX10.1 compatibility, a strong multimedia feature-set, and pricing that most could afford, ranging from £50-£75. Sapphire, ATI's largest add-in-board partner, lists no less than 10 products based on Radeon HD 4600, split equally over HD 4650 and HD 4670. There are bone-stock cards, those with greater-than-normal memory, faster memory, overclocked cores, etc, so picking the right card can be difficult. We'll take a look at two Radeon HD 4600-series cards, both with some special sauce, but costing less than £80. Read on to find out which is best.